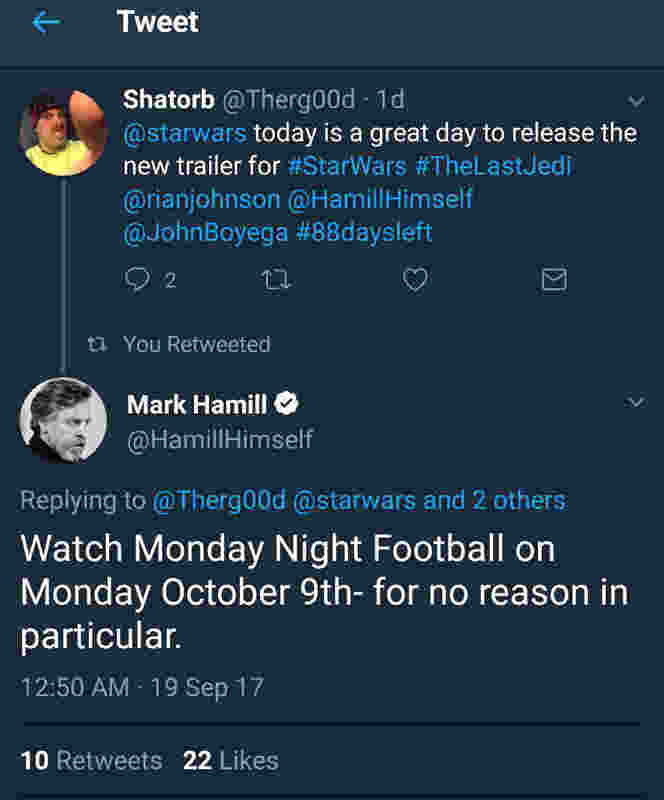 New The Last Jedi Trailer to Premiere on Monday Night Football October 9th | Nerd Much? A fan made a Hail Mary attempt to get some insight as to when the latest Star Wars: The Last Jedi trailer would drop. And it looks like it may have worked. Now, this could be an absolutely fantastic level of trolling by Hamill. 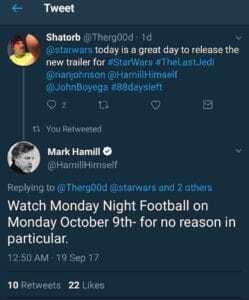 Or, it could be quite possible that Star Wars: The Last Jedi will indeed see its final trailer drop during that night’s Monday Night Football broadcast featuring the Minnesota Vikings at the Chicago Bears. Monday Night Football is aired weekly on ESPN whom is owned by Disney. Who, of course, now own the Star Wars brand. The timing seems as though it meshes well too. Star Wars: The Last Jedi is set to release in the U.S. on December 15th. If the targeted date for the trailer actually is October 9th, that’s roughly 10 weeks before the movie’s debut. And Disney would also be doing the trailer’s release on one of the most high profile and watched programs of the week. Big audience. Their own network. It’s a win/win for them. 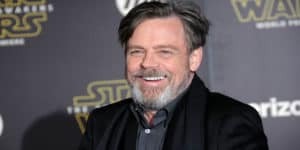 Again, whether Hamill is giving fans a wink and a nod here or is simply toying with us can’t be gleamed at this point. But if it is a troll, it’s one that certainly makes sense for fans to get behind. We’ll just have to wait and see whether Master Luke is playing Jedi Mind Tricks on us or not.